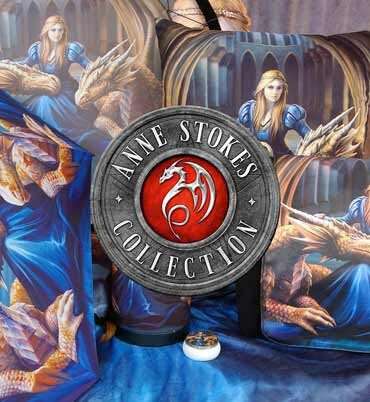 Exclusively available from Nemesis Now’s Premium high-quality wholesale collection, this enchanting mirror box come from the imagination of internationally known Fantasy artist Anne Stokes. Standing on a rocky platform, this red-haired mage wears a long, white flowing robe over her blue dress, brown gloves coming to her elbows. In her left hand she holds an arcane staff, a red egg-shaped jewel set in the end glowing with magical power. A white, violet-tinged Dragon curls around her, wings shielding her protectively, while she lifts her other hand to scratch under their chin. Around them, glowing red crystals emerge hesitantly from the rock. A mirror sits inside of the box’s lid, ensuring that you always look good enough to do magic.